Apply For Training and Placement Program!!! Welcome to Tiny Planet Inc. OPT-Optional Practical Training VISA Fee, Regulations, Extension, and FAQ's. 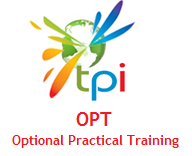 Optional Practical Training (OPT) is temporary employment directly related to an F-1 student's major area of study. USCIS H2B Cap Count Update For The Fiscal Year 2014, Welcome to Tiny Planet Inc. Immigration News. This blog is official blog of Tiny Planet Inc. |The information collected from various sources use information with your own risk.